West Bengal Municipal Service Commission Recruitment Notification 2019|150 Junior Engineer Online Vacancies. 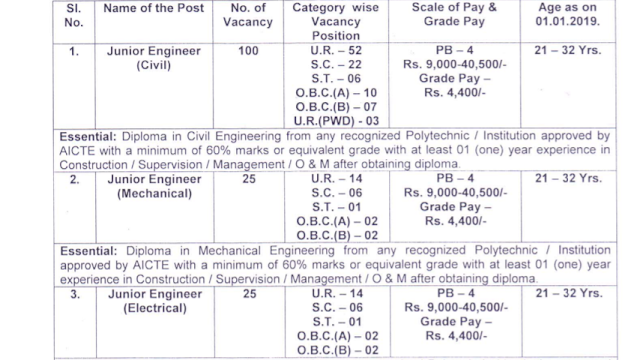 The West Bengal Municipal Service Commission, India, Is Appointing Eligible Civil/Electrical/Mechanical Junior Engineer From 13th Of February, 2019 Onwards Through Online Application Form Mode, So Interested People Can Apply For This Job Within The Given Data And Time, Which Is Mention Below. Junior Engineer (Civil) →100 Vacancies. Junior Engineer (Electrical) →25 Vacancies. Junior Engineer (Mechanical) → 25 Vacancies. Total Number Of Vacancies →150 WBMSC 2019, Kindly Check Out The Image Below For Vacancies Distribution. B. Eligible Criteria For MSCWB Junior Engineer Vacancies 2019. Age Limit →21 To 32 Years. Educational Qualifications →Engineering Degree In Concern Discipline. Mode Of Examination/Selection Process→Will Be Notified On The Official Website Later, Link Is Given Below. Online Application/Examination Fee →Check Out The 2nd Image Above From The Official Notification West Bengal Municipal Service Commission 2019. For More Info →For Information Related To MSCWB Junior Engineer Admit Card Download, Exam Result And More Visit The Official Website Time To Time, Link Is Here>The Official Website Of West Bengal Municipal Service Commission (WBMSC) . Now Apply For This Job Recruitment Examination, 2019 For Different Category Of Posts Under Kolkata Metropolitan Development Authority 2019. Thanks For Your Support And Keep Visiting Here For More Info On Job In West Bengal And Other, Till Then Stay Safe And Blessed.